This book addresses relevant childhood concerns in a thoughtful and sensitive manner while maintaining a sense of fun. Sleepovers can be fun, exciting, and anticipated with delight … unless your name is Susannah and you are fairly certain that your best friend Lola’s house is haunted. 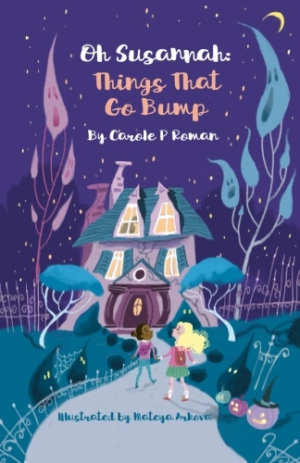 Things That Go Bump, the second book in Carole P. Roman’s Oh Susannah easy chapter-book series for beginning readers, uses humor and compassion to explore the scary, spooky, and often silly side of being seven. Spiders in the basement, creepy paintings on the wall, and an irritating older brother filling her head with frightening tales of malicious spirits are causing Susannah to dread her upcoming sleepover at Lola’s possibly ghost-infested home. Bolstered by a little insight and support from her parents and a much-needed dose of courage, she is determined to confront her fears once and for all. Lovably anxious and introspective, Susannah is cautious and easily overwhelmed. But throughout the series, which focuses primarily on one problem or emotional concern at a time, she is slowly learning to express herself and ask for help when needed. Although geared for a younger, elementary-age audience, middle readers may enjoy the Oh Susannah stories as well, particularly fans of J. K. Rowling’s Harry Potter and the Sorcerer’s Stone, elements of which are discussed and debated in Susannah’s class at school. A slim volume divided into ten brief chapters, Things That Go Bump has a straightforward style. It introduces the idea of being afraid of something or fearing the unexpected, and then immediately working through the issue. Different characters reveal a variety of aversions and phobias from unicorns, clowns, and ghosts to strange sounds, the dark, and practical jokes, but the focus is on Susannah and her confusion over the existence of ghosts and apprehension at the thought of staying at Lola’s house. Grayscale sketches by Mateya Arkova illustrate each chapter and lend a festive, Halloween-ish air to the late-October setting. Things That Go Bump addresses relevant childhood concerns in a thoughtful and sensitive manner while maintaining a sense of fun.